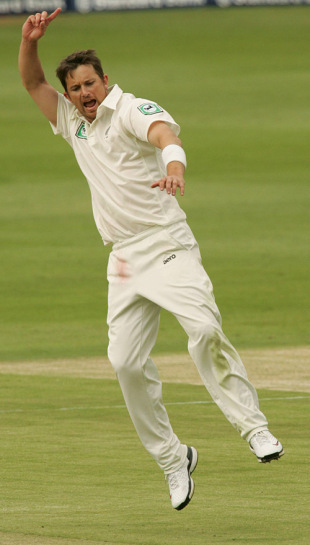 Shane Bond has made himself available for New Zealand selection after cutting ties with the ICL. Bond has not played for his country in 18 months, since joining the unofficial Twenty20 tournament, but told local media that he was fully fit and raring to go. "I love Test cricket, it's the pinnacle, and it would be nice to have another chance to play," Bond told NZPA on Friday. "I'm available if they [NZC] want me. Earlier this month NZC chief executive Justin Vaughan told the Sunday Star-Times he had received documentation from the legal representatives of Bond, Daryl Tuffey and Craig McMillan indicating they had cut ties with the ICL. New Zealand are due to tour Sri Lanka in August-September - the A team is expected to visit India around the same time - and Bond, 34, has expressed his keenness to tour. "I've spoken to [selection panel manager] Glenn Turner and said I'm available to be picked but I expect to be picked on merit, like everyone else," said Bond. "I hoped that through my domestic cricket [for Canterbury last summer] it perhaps put me into consideration for an A tour. If it didn't then I'd try and do my time in first-class cricket and get back that way. But I've got to get cricket behind me and prove I can still perform." "He's obviously had a rethink, now we have to see if the body will stand up to it. Time will tell," said Turner. "If he can produce the goods, that's great." Bond performed strongly in last season's domestic tournaments, taking 19 wickets at 23.5 in the State Shield and 11 at 14.3 in the Twenty20. "I still felt I was the fastest bowler going around, but I wasn't in the best condition and have made a real concerted effort to pick my fitness up," he said. "I wanted to see if I still had it in me to do the training required, and was pleasantly surprised and feel rejuvenated. "I've done three months' solid training and it feels really good. If I get picked for the A side that's six weeks away, but whenever it may be I'm just excited about playing again." In 17 Tests Bond has taken 79 wickets at 22.39 each, and in 67 ODIs he has 125 wickets at 19.32.